To ensure that all voices of the Jamaica Plain community are heard, JPNC members are elected from within one of three different geographic areas. The 20-member council is made up of five members from each area, as well as five at-large members. Area “A” is Ward 10, Precincts, 6, 7, 8 and 9 (east of South Huntington Avenue); Ward 11, Precincts 4 and 5; and Ward 19, Precinct 1. 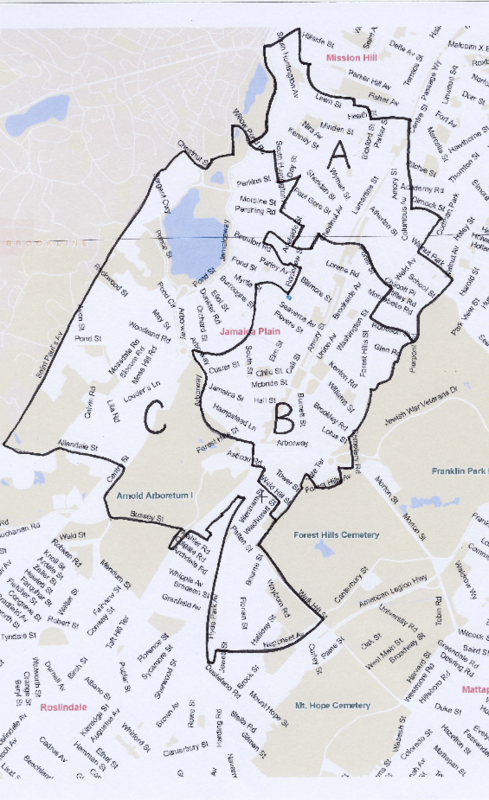 Area “B” is Ward 11, Precincts 6, 7, 8, 9 and 10; and Ward 19, Precincts 4, 6, and 9 (East of Centre Street). Area “C” is Ward 10, Precinct 9 (west of South Huntington Avenue); and Ward 19, Precincts 2, 3, 5, 7, 8, 9 (West of Centre Street) and 12. “At-Large” is all three areas of JP. Still have questions about which area you reside in? Send us an email.